Lost In The Warp: Introducing Frank & Stein - my Dire Troll Bomber Team! 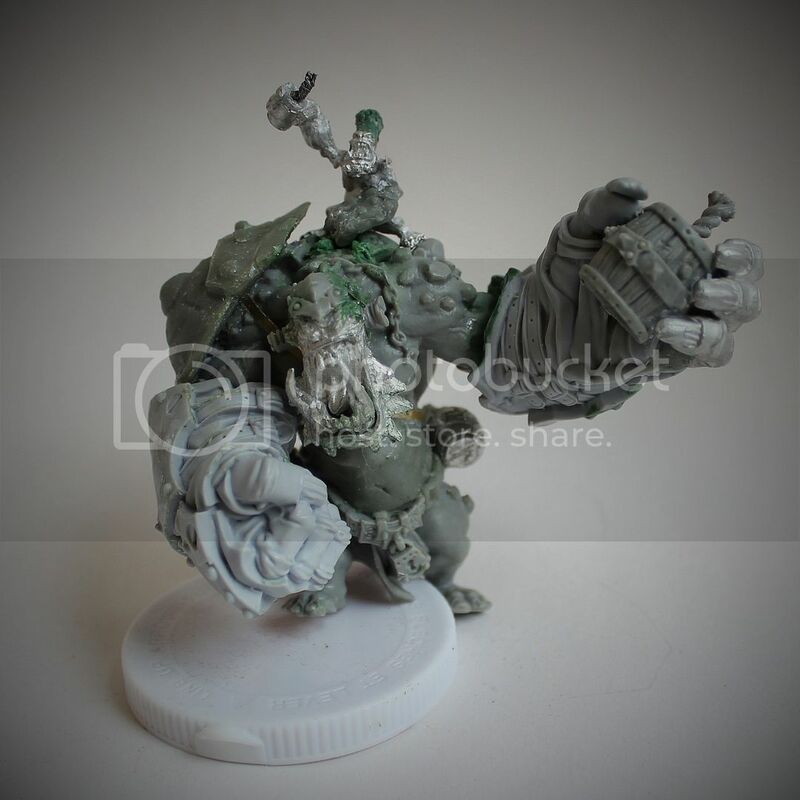 Introducing Frank & Stein - my Dire Troll Bomber Team! hehehe the hands are SO MUCH BIGGER than this... but dang this looks cool! 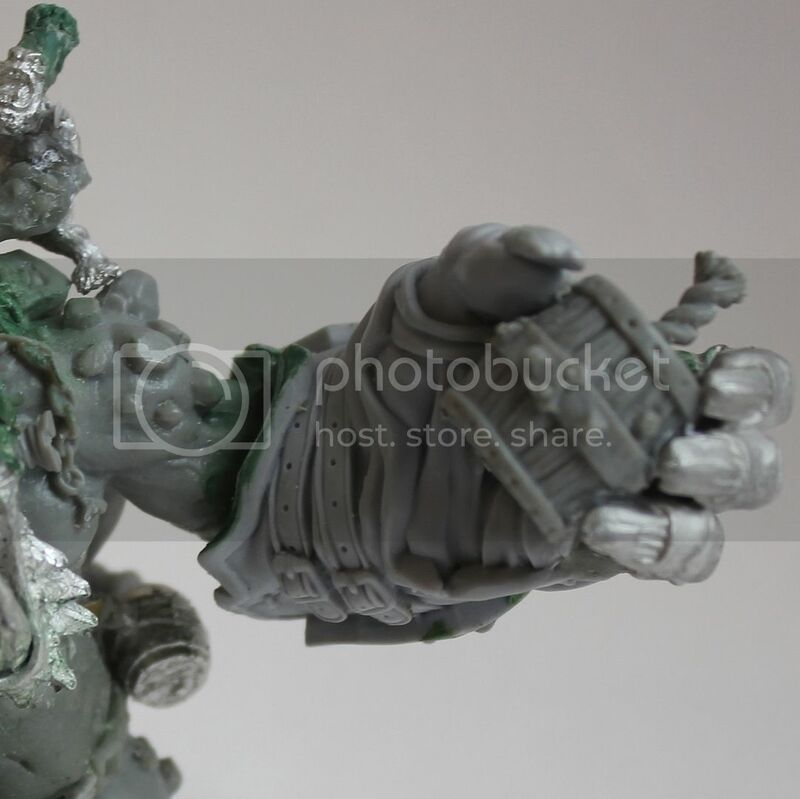 Once upon a time I was digging through the forums at privateer press and cam across a model that I thought was pretty darn cool - turned out it was actually just a digital mock up that forum member Maximum had made when people were trying to figure out how big Dozer and Smig's hands were when the initial pics of them had been leaked and what the model could look like... 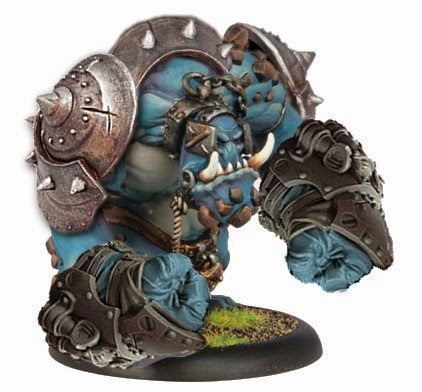 He pasted them on to an image of a dire troll and then used bouncer shields as shoulder pads to camouflage the arm joins etc. Having just cut apart Dozer for my Mega Mulg project I had a set of the hands just kind of kicking around and thought - what the heck lets give it a try. First thing I discovered was that Maximum's estimate of the size of D&S hands was under - by a lot. Those frikking hands are HUGE. But I had little to lose and thought that the bouncer shields might really offset some of the size disparity so I pushed on. Using my leftover Extreme Mauler head really helped as it was much bigger than the standard plastic head and brought more overall proportional balance to this (still mostly ridiculous) model. That was actually a tough choice because I did so like the look of Maximum's inspiration piece with the blitzer head, but I figure Ill be building at least one blitzer still so Ill get to use that head yet....and this really did add a lot to balancing the sections of the figure. As with Mulg I wanted to make sure that it stayed close to the definitions of legal for Tournament play - and looked to the defining features of the actual bomber model for inspiration. I used the correct back piece for the bomber kit and carefully cut one of the bomber "bombs" from the hand so that I could it it in the D&S hand. A little Green stuff later and the hand close around the refinished bomb nicely! I used a couple of extra mule barrel/kegs and some smaller ones from various Trollblood models (I bits ordered a bunch directly from PP a while ago) to fill out the area along the belt line and around the back. Really easy and really worked out! I also noticed the helmet head on the bomber and felt that this was one of the things that was specific to differentiating this model from the other trolls in the kit so I cut the helmet away and mounted it atop the extreme head and then added some straps from brass etch (1/35 german tie down straps). It actually made the extreme head a little more normal looking but what I really like it the way the brass straps look like he has just burst them in the moment and really give some life to the overall model! I also removed all the gear that was strapped to the gloves - the missiles/shells, an axe, bedroll, pouches, straps etc (hey there was a lot of room to fill on those!) and went about refilling the resulting holes with greenstuff and apoxie sculpt (apoxie sculpt is way easier to smoothly blend in for surfaces like this btw...) I decided to leave them less than 100% level - giving them a slightly dented appearance instead. A light sanding to finish and they looked great! I then added the shoulder pad which was a Bouncer shield press molded using Instant Mold from Cool Mini or Not and Apoxie sculpt. Once it was hardened and attached I added a brass strap across the body. I looked at whether to add the second bouncer pad like Maximum's original artwork had featured But I really liked the asymmetry of just one and felt that it gave me more range of pose for the bomb holding arm not to have the second pad. It was at this point that I realized there was still something missing and that a whelp was really needed to finish the composition and raise the eye level above the huge lateral axis created by the huge hands. I briefly thought about using the stock bomber whelp and was explaining to a friend about how I had "frankensteined" this whole thing together from leftover parts when I was hit square in the face with inspiration. Like Dozer and Smig - I could really characterize this duo as Frank and Stein! With all personal the character focused attitude featured in the current Riven Bonds league play I knew I was really on the right path! 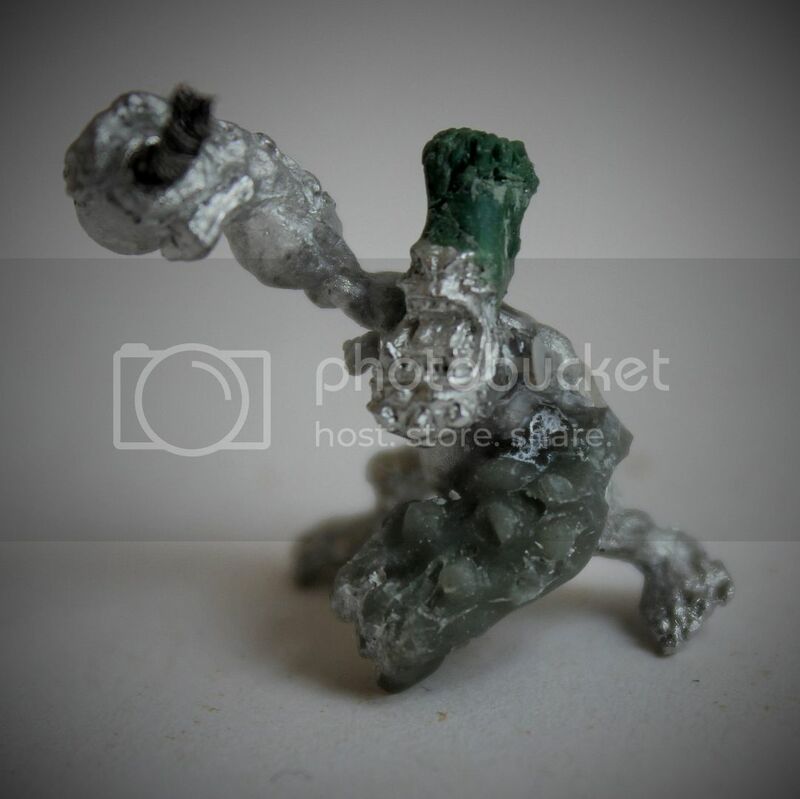 I made a press mold of Smig's arm and grabbed a metal whelp with the bottle. a few snips + a bit of wire later and I had modified the bottle into a bomb, taken off the other arm and married the cast of smigs fist to the body. I took some greenstuff and gave him a frankenstein-esque tall forehead and hairdo and then added some grandt line bolts to the whelps neck! 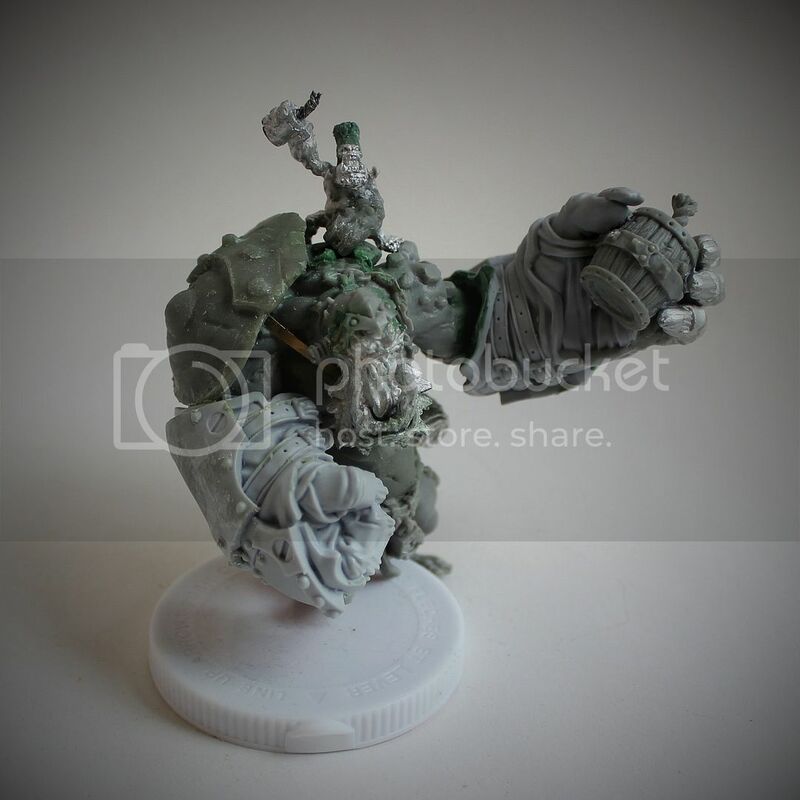 I then took some screws/bolts from the Cephalyx monstrosity sprues and added them to the neck of the dire troll to give a bit of thematic continuity. It looks pretty cool! 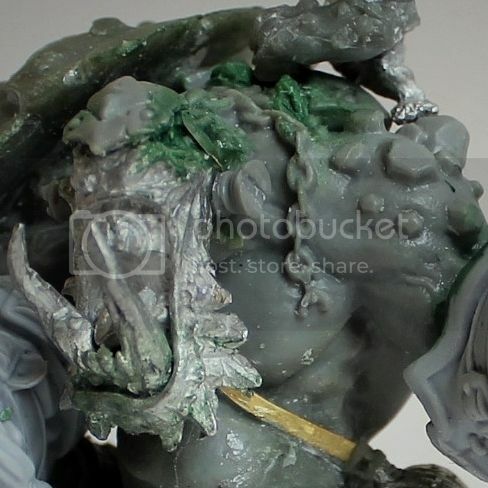 Cant wait for my Bases from CMON/MAS to finally come in as I will be able to stand him up properly and start laying in some paint!